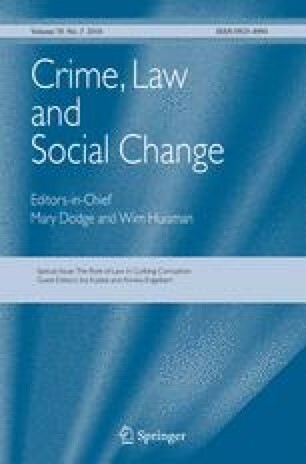 This paper argues that using a legal approach to fight against corruption having a cultural root is unlikely to be effective. By analyzing the Eight-point Regulation, one of Xi Jinping’s anti-corruption measures, the present study shows that the efficacy of the Regulation is limited, notably when it comes to non-economic types of corruption. In fact, the Regulation does not halt the culture of gift giving, which is a common practice for the Chinese to establish guanxi (social connection) for potential or actual corruption. Based on the findings, this paper proposes complementary measures to curb corruption in addition to legal approaches. Barbalet, J. (2017). Guanxi as social exchange: emotions, power and corruption. Sociology. https://doi.org/10.1177/0038038517692511. China Daily (2012). Eight-point regulation. http://cpcchina.chinadaily.com.cn/2012-12/05/content_15992256.htm. Accessed 30 Aug 2017. Transparency_International. (2014). Anti-corruption: changing China. https://www.transparency.org/news/feature/anti_corruption_changing_china. Accessed 30 May 2017.